Today’s Album Of The Week is Jerry Lee Lewis’ first LP for the Smash / Mercury label, “THE GOLDEN HITS OF JERRY LEE LEWIS”, first released in 1964, with new recordings of 12 tracks previously recorded for SUN Records. En septembre 1963, Jerry Lee LEWIS quittait le label SUN pour entamer un parcours de 15 ans chez SMASH et MERCURY. Le premier album qu'il enregistra chez SMASH consistait en des reprises de 12 titres primitivement mis en boîte pour SUN, des titres réarrangés et remis au goût du jour. Sans prétendre atteindre à la qualité des versions originales, ces 12 morceaux vous rappelleront certainement plein de souvenirs agréables. 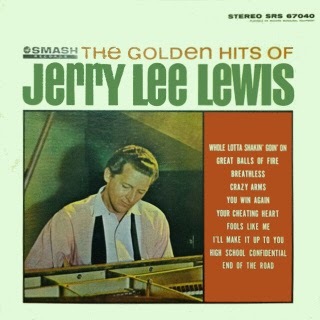 Cet album, paru début 1964 s'intitulait "THE GOLDEN HITS OF JERRY LEE LEWIS". C'est lui qui sera notre disque "fil rouge" cette semaine. 2. Don WINTERS - "Pretty Moon"
3. Joe DYSON - "Looped"
4. Eddie DANIELS - "Hug Me, Kiss Me"
6. Dock STARKES And The NITERIDERS - "Love Me Like Crazy"
8. The TEMPESTS  - "Rockin’ Rochester U.S.A."
9. Lloyd PRICE - "Such A Mess"
11. Mel SMITH - "Pretty Plaid Skirt"
12. LITTLE SHELTON - "Sea Cruise"
14. George DARRO & The VI-KINGS - "The Southern Twist"
15. GENE & AL’S SPACEMEN - "Mercy"
17. Tony SHEPPERD - "Zach (Zack)"
18. Eddy SEACREST - "Shakin With A Flavor"
20. (Cousin) Herbert HENSON - "Lose My Mind"
21. Charles BROWN & Amos MILBURN - "Educated Fool"
23. Danny ROSS - - "Look At You Go"
24. Jimmy CLANTON - "Go, Jimmy, Go"
25. Johnny CANALES - "Johnny B. Goode"
26. Chuck BERRY - "Carol"
27. Donnie NIX - "Ain’t About To Go Home"
29. The CHAVIS BROTHERS - "So Tired"
30. Elvis PRESLEY With The JORDANAIRES - "Suspicion"
32. The HAMPTONES - "Turkey Hop"
33. FATS DOMINO – "Ain’t It A Shame"
35. Roy ORBISON – Orch. & Chorus Cond. By Bob Moore - "Up Town"
36. SCREAMIN’ JOE NEAL - Jerry Brown Orch. - "Rock ‘N’ Roll Deacon"
37. Gene VINCENT - "She She Little Sheila"
38. TOM And The CRAFTSMEN - "The Work Song"
40. Carl PERKINS - "Whole Lotta Shakin’ Goin’ On"
41. Johnny BURNETTE - "Rock Therapy"
42. Amos MILBURN - "Girl Of My Dreams"